Adam Sawicki, a member of AMD RTG’s Game Engineering team, has spent the best part of a year assisting one of the world’s biggest game studios in porting one of their AAA games to Vulkan™. That kind of experience — embedded with the game developer and working hands-on in their codebase alongside their own engineers — is always worth sharing whenever possible. 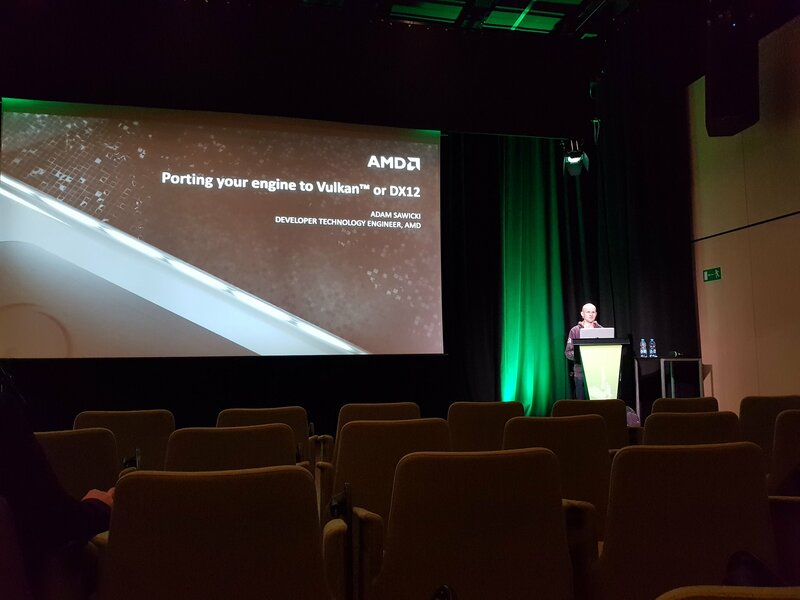 Adam has turned what he learned into a general presentation aimed at those looking to port a game engine to either Vulkan or DirectX® 12. The presentation runs the gamut of topics you’d encounter when bringing an existing rendering system to one of those new explicit graphics APIs, from why you’d want to do it in the first place, all the way to practical matters related to optimisation and debugging using tools like Radeon GPU Profiler and RenderDoc. Best of all? Adam recently gave the talk in person at Digital Dragons 2018, one of Europe’s biggest games industry conferences held at the end of May in Krakow, Poland. So you can download the slides for reading at your leisure, plus you can follow Adam presenting it himself via the video on YouTube embedded below! Our big thanks to the Digital Dragons organisers for filming everything and making it freely available. If you’re about to embark on a porting mission yourself, or simply want to learn more about what’s involved and how to tackle it, find 45 mins, grab your preferred beverage, and press play. Hi! Is this possible with common Engines like Unreal Engine 4/Unity? This is not a process for those who use Unity/UE. It would be a process for the makers of Unity/UE to add DX12/Vulkan to their engine. You need to modify source code. Not only that, but it won’t help without you rewriting the shaders used in the engine to take advantage of the new device driver’s needs. If you have your own engine, this will be useful to you. Hmm… “Some AAA from DX11 to Vulkan” “it’s a big one”. Ok so that means is a RELEASED title with DX11, that Developer could very well be Bethesda, Rockstar or CD Projekt. So maybe… just maybe… GTA5, Skyrim or Witcher3. My take is Witcher3.